Mamba is the common name for any of the several fast-moving, venomous African snakes comprising the elapid genus Dendroaspis, characterized by large scales, large eyes, extremely toxic venom, absence of hoods, and, as with other members of the Elapidae family, hollow, relatively short, permanently erect fangs in the front of the mouth that deliver the venom. 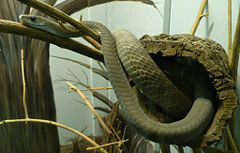 The black mamba (D. polylepis) is particular well-known for its extremely potent neurotoxic venom and a reputation as sometimes aggressive towards humans; without antivenom, its bite is nearly always fatal. With the exception of the black mamba, which is a ground dwelling species, other Dendroaspis species are more strongly arboreal. Ecologically, mambas provide a valued function by helping to control populations of their prey species, such as rodents (mice, rats), squirrels, and other small mammals. They themselves contribute to the terrestrial food chains by being preyed upon (as adults, young, or eggs) by mongooses, foxes, crocodiles, and birds of prey, among other animals. For humans, mambas can represent a major medical problem and thus are generally feared, and the black mamba may be the most feared snake in Africa. However, most mambas, including the black mamba, would rather avoid confrontation and flee rather than strike. However, confrontations, including blocking the path of the snake to its refuge, can result in the snake becoming aggressive, with deadly results. This is coupled with the fact that some mambas take up residence in populated areas. On the positive side, mamba venom is being investigated as a potential painkiller and aid in blood coagulation. And they aid greatly to the wonder of nature (and need to be ever observant). Mambas are part of the Elapidae family, along with cobras, coral snakes, death adders, and, in some taxonomies, sea snakes. Elapids are a family of venomous snakes, and include some of the world's most deadly snakes (like the black mamba). Elapids are differentiated from the other major family of venomous snakes, Viperidae, by their venom delivery system. Elapids have hollow, permanently erect, relatively short fangs in the front of the mouth that channel venom into the prey. Viperids, such as rattlesnakes, moccasins, and puff adders, have two, long, hollow, venom-injecting fangs that fold back against the roof of the mouth, tip upward, when the mouth is closed. Mambas lack a inflatable neck hood as with the cobras—the cobra's hood being a flap of loose skin behind the head that the snake can inflate, making the snake appear bigger. However, the relationship of mambas with cobras can be seen in the fact that mambas, during their threat display, can inflate their necks somewhat. They do this while gaping their mouth. In the mamba genus, Dendroapsis (or Dendraspis), there are generally four extant species that are recognized, along with various subspecies (ITIS 2004). These four species are Dendroaspis angusticeps (eastern green mamba), Dendroaspis jamesoni (Jameson's mamba), Dendroaspis polylepis (black mamba), and Dendroaspis viridis (western green mamba). The black mamba reside on the ground, in hollow insect mounds, abandoned burrows, and rock crevices. The other species are more arboreal. ("Dendroaspis" literally means "tree snake.") The black mamba, however, is a good climber and can very quickly go up a tree. The black mamba is the largest venomous snake in Africa and the second longest venomous snake in the world. Adult black mambas have an average length of 2.5 meters (8.2 feet) and a maximum length of 4.5 meters (~14 feet) (Perry 2001). On the king cobra (Ophiophagus hannah) of Asia is longer, growing to a length of 5.7 meters (18.5 feet) (Mehrtens 1987). The eastern green mambas (Dendroaspis angusticeps) is the smallest member of the mamba family, averaging 1.8 meters (5.9 feet), with known specimens to 3.7 meters (12 feet). Mambas are very widely distributed in sub-Saharan Africa. They have been reported in Kenya, Tanzania, Mozambique, Malawi, Zimbabwe, South Africa, Ghana, Togo, Benin, Nigeria, Cameroon, Guinea, Gabon, Principe (Gulf of Guinea), Central African Republic, Democratic Republic of the Congo, Congo, Uganda, Rwanda, Burundi, Equatorial Guinea, Angola, Sudan, Botswana, Burkina Faso, Eritrea, Senegal, Mali, Ethiopia, Ivory Coast, Namibia, Somalia, Swaziland, Zambia, Gambia, Guinea Bissau, Liberia, Ivory Coast, and Sierra Leone (Uetz 2008). In attacking their prey, predator, or a human being, mambas will raise up its body to strike, aiming at the head or trunk. Unlike most other snakes mambas will strike repeatedly if cornered, and have been reported to bring down a giraffe and a lion with their venom. Their normal prey is small warm-blooded prey, such as rodents, ground squirrels, and other small mammals. When hunting small animals, the black mamba delivers one or two deadly bites and backs off, waiting for the neurotoxin in its venom to paralyze the prey (Mastenbroek 2002). When killing a bird, however, the black mamba will cling to its prey, preventing its departure. The black mamba has an extremely potent neurotoxic venom that attacks the nervous system, and cardiotoxins that attack the heart; the bite is often fatal to humans without access to proper first aid and subsequent antivenom treatment, because it shuts down the lungs and heart. 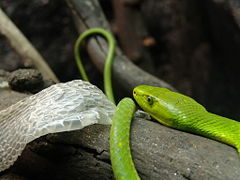 The Western green mamba (D. viridis) and Eastern green mamba, (D. angusticeps), possess venom that is roughly equal in potency to that of the black mamba. However, they are not nearly as aggressive. Prior to the availability of antivenom, envenomations by members of this genus carried a nearly 100% fatality rate. However, with antivenom being much more available today, fatalities have become much more rare. Mamba toxin 3, which inhibits M4 receptors (Rang 2003). Mamba toxin 7, which inhibits M1 receptors (Rang 2003). The black mamba (Dendroaspis polylepis), the largest venomous snake in Africa, is one of Africa's most dangerous and feared snakes. It has a wide range of known locations throughout Africa, including being native to Somalia, Ethiopia, Kenya, Botswana, Uganda, Zambia, Zimbabwe, Angola, Namibia, Malawi, Mozambique, South Africa and the Congo. They inhabit a wide variety of areas that include open savannas, open woodlands, and rocky outcrops (Switalski and Smit 2007). The black mamba is not named for the color of its body (which is usually a shade of gray or charcoal), but for the highly pigmented interior of its mouth, which it will display to predators. The name "black mamba" is somewhat confusing because it contradicts the snake's actual color. 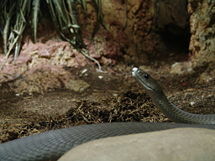 Its body is not black at all; normally, mambas have a dark olive, olive green, gray brown, or metal color. The name comes from the highly pigmented inky black interior of its mouth, which it will display to predators. As mambas get older, their skin begins to darken (Mastenbroek 2002; Perry 2001). Black mambas are are diurnal. During the day they actively hunt their prey of small mammals, birds, and lizards. They return to the same lair nightly. The eastern green mamba or common mamba (Dendroaspis angusticeps) is indigenous to the eastern side of southern Africa. The species is found in forests chiefly near the coast stretching from the Eastern Cape in South Africa through Mozambique and Tanzania as far as south-east Kenya, going inland as far as southern Malawi and eastern Zimbabwe. The green mamba is overall glossy grass-green in color with light bright green underside. A green snake that is spotted, bluish, or has yellow or white undersides is not a green mamba. However, green mamba hatchlings have a yellowish-green color. 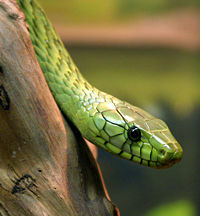 Green mambas are slender snakes, with a distinct head and long, thin tail. The green mamba is highly arboreal and seldom ventures to the ground unless following prey or basking. Green mambas are diurnal. Unlike the black mamba, it is a shy and unaggressive snake, and does not often gape and strike if threatened but usually makes a swift escape. Continued provocation will cause the snake to strike, and bites, although serious, are uncommon. Green mambas make their homes near trees, often in evergreen forest, coastal scrub, or moist savanna. Bamboo thickets and mango plantations are also known to be mamba habitat. Their diet consists primarily of adult and juvenile birds, birds' eggs, and small mammals. Young mambas occasionally eat other reptiles, such as chameleons. The western green mamba or West African green mamba (Dendroaspis viridis) is a long, thin, arboreal snake native to West Africa, including Liberia and Côte d’Ivoire. It has large green scales outlined in black, and grows up to two meters in length. The scales on its long tail are yellow and edged in black. Integrated Taxonomic Information System (ITIS). 2004. Dendroaspis Schlegel, 1848. ITIS Taxonomic Serial No. : 700211. Retrieved January 9, 2009. Mastenbroek, R. 2002. Black mamba. Richard Mastenbroek's Elapid Pages. Retrieved January 9, 2009. Mehrtens, J. 1987. Living Snakes of the World. New York: Sterling. ISBN 0806964618. Perry, M. 2001. Black mamba. African Reptiles and Venom. Retrieved January 9, 2009. Rang, H. P. 2003. Pharmacology. Edinburgh: Churchill Livingstone. ISBN 0443071454. Rasmussen, P. and R. Schott. 2005. Dendroaspis polylepis. Animal Diversity Web. Retrieved January 09, 2009. Switalski, J., and M. Smit. 2007. The black mamba. Venomous Reptiles. Retrieved January 9, 2009. This page was last modified on 20 January 2009, at 15:36.